I am just about to begin a DIY project that will help improve my playroom space. I need a good way to organise my toys and particularly my ever expanding collection of latex hoods. 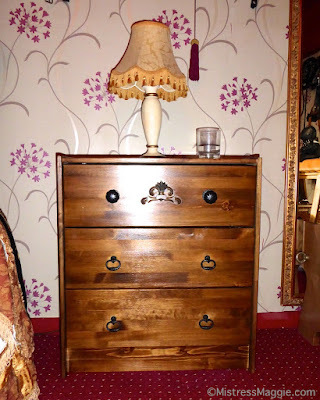 I hope to transform a piece of inexpensive pine furniture which I found at a charity shop into an antique style chest of drawers that’s in keeping with my other pieces of playroom furniture. A dark oil wood stain, cast iron handles and a decorative applique have all been purchased to jazz up my wooden chest. I am quite good at DIY, it should not take me too long to have it complete, and I reckon it will be finished and looking good in my playroom in just a matter of days. At last I can look forward to having a dedicated space where I can store my latex hoods. Here's the finished result. I think it looks right at home in my play space.